We’ve all had the pleasure of having a fly zoom all around our house, and waiting for it to land to hit it, just for it to take off and seemingly know your newspaper or swatter was coming. We often think that we were just too slow for the flies and then we try swatting at the fly only to miss again. Are we just too slow for flies or are flies just psychic? It turns out that in a way, flies do have some psychic ability. 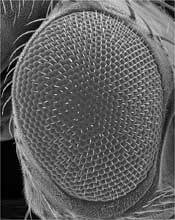 Flies have very special compound eyes that allow them to have an extremely wide field of view. Their eyes are made up of thousands of lens called ommatidia. These compound eyes allow for flies to have a 360 degree field of vision, allowing them to easily see behind them as well. Using these eyes, flies can also easily detect fast movement. Flies also have an incredible ability to detect changes in air currents. So how do these two abilities help flies avoid their death? Flies are also incredibly talented flyers; they are born with a special gene called spalt. This gene allows for flies to grow flight muscles that are regulated by contractions as well as tension. One muscle moves the wings down while the other muscle stretches the other muscle, creating tension and allowing for wing oscillations. Using their compound eyes and detection abilities, flies can sense when an incoming object like a swatter is flying at them. Although flies have an incredibly small brain, they have amazing brain calculation abilities. Once a fly senses a swatter coming from the front, the flies moves its legs forward and then bends back and leaps backward. When a swatter is coming from behind, flies moves its legs backwards and then jumps forward. All of these calculations happen in about 100 milliseconds after a fly identifies a swatter. As we all know, flies can be in many positions: on food, on the wall, walking, or just grooming itself. However, flies can make extremely fast pre take off calculations to avoid danger no matter what position is it in. After a fly makes its leap, the fly is incredibly out of control. However, these small little insects manage to somehow start flapping their wings and start flying off. So what can we take from this leaping and flying ability of flies? In a way, we have to out smart these flies. Instead of wildly swinging at flies, hoping to kill them. It is best to sneakily approach a fly and aim ahead of there you think they may jump. Hopefully, this information will help you in your endeavors of killing them annoying amazing little flyers. Jamie also wrote a post about flies, and she found out that they can make amazing turns in mid-flight, so fast that in theory they could make 10 full 180-degree turns in one second. Also, check out this video about the “swatter science” work of Prof. Dickinson!